As I've explained in this series, strategic planning is an old school approach that is not strategic and focuses leadership in the wrong place. Let's look at the fundamentals of the "new school" of strategic leadership. 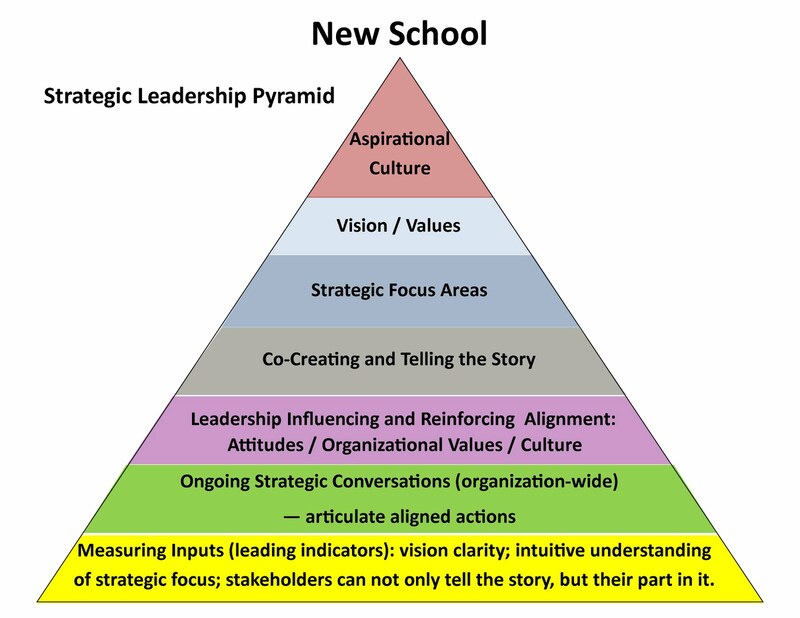 We'll begin by replacing the "Strategic Planning Pyramid" with a "Strategic Leadership Pyramid," both illustrated below for comparative purposes. As stated in previous posts, what we've been calling "strategic planning" is really operational, not strategic; it is, in fact, project planning methodology. And this methodology is fine when it is applied to project management. In fact, it's the best approach to take when hard deadlines exist and detailed action plans are critical. For example, it is ideal for planning conferences/trade shows, product launches, construction projects, marketing plans, publications, etc. Anything that has logical steps, firm deadlines and lots of details. But it's the wrong tool for strategic leadership. Values aren't steps in a plan. Vision is not a project and it doesn't have a deadline. A strategy is a choice, a focus, not a destination, and it requires an agility that a written plan can't provide. Organizational culture doesn't operate using goals, objectives and action plans. Attitudes and mindset can't be effectively influenced by a plan. But the opposite is true. Execution of vision, strategies, goals, etc., is influenced by organizational culture, attitudes and mindset -- particularly if they are unsupportive. What are vision/values/culture driven by? People. Not process. Therefore, the most effective approach to ensure vision execution is one that is people-focused, not process-focused. That means focusing on mindset (people), not goals/objectives and action plans (process). In a previous post entitled "Leadership Needs to Focus in the Right Place to Build a Strategic Organization" I stated that with traditional strategic planning approaches, an inordinate amount of time is spent on management/operations activities where leadership should spend NO TIME AT ALL, and strategic planning methodology quickly shifts the focus from leadership to management. 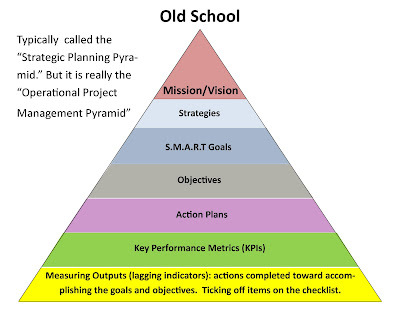 You'll note that none of the activities in the Strategic Leadership Pyramid include goals, objectives, action plans, key performance metrics, etc. If those who execute on vision (including top leadership) want to use goals, objectives and action plans as part of their operational methodology for executing on vision, great. Goals, objectives and action plans are good tools for personal time management, as well as focusing team activities when accomplishing complex projects. 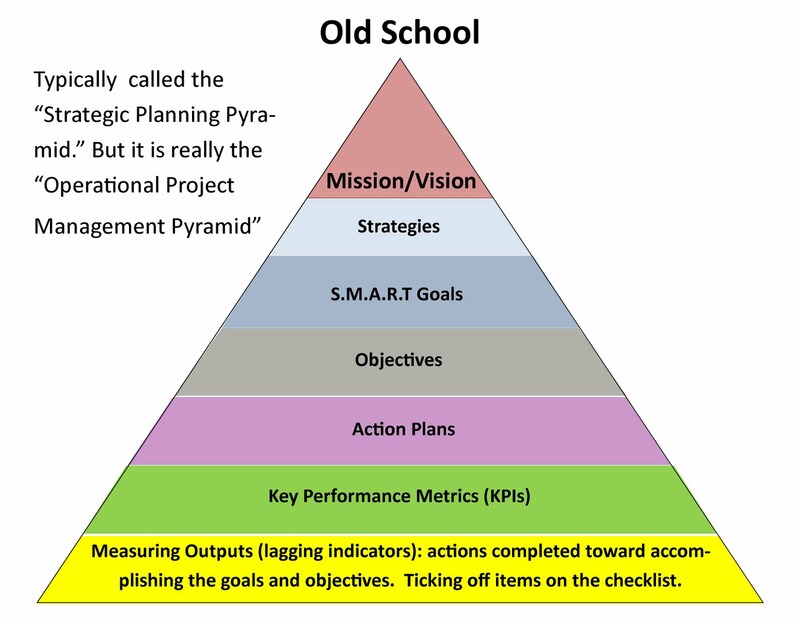 But as I've also previously written ("I Still Say Strategic Planning is a Flawed Concept"), planning and goal-setting methodologies are just one among many tactical approaches to taking actions aligned with organizational vision, and not always the best approach. Aspirational Culture is at the top, not Vision. Why? As I explained in "Alignment Comes Before Vision," the "way we do things around here" supersedes desired outcomes. By necessity, leadership focus must begin here. "Aspirational Culture" means the desired way we work together as an organization. Before we begin crafting vision statements, we need to be sure we have clarity on the organization's "personality," the unwritten rules of behavior. We should know in advance of crafting a vision whether the organizational culture will support it. If not, we need to work on building our aspirational culture first. A note of caution here. It's tempting to judge organizational culture traits as "good" or "bad." For example, if you are a creative, daring and innovative person, you may view an organization with a culture that is conservative and risk averse as "behind the times" or "unwilling to step out of its comfort zone." However, such an organization might be highly effective and successful if its vision plays to its culture. For example, even though it may not be innovative, perhaps it creates traditional, timeless quality products with unparalleled craftsmanship, which gives it a competitive edge in the market. What makes organizational culture problematic is when it lacks alignment on identity, values, ethics or trust. To illustrate a lack of alignment on identity, I'll go back to the previous example. If leadership and fraction of the staff is daring and innovative but the vast majority of the organization is conservative and risk averse, the ability to find alignment around a vision focused on innovation will be highly compromised. 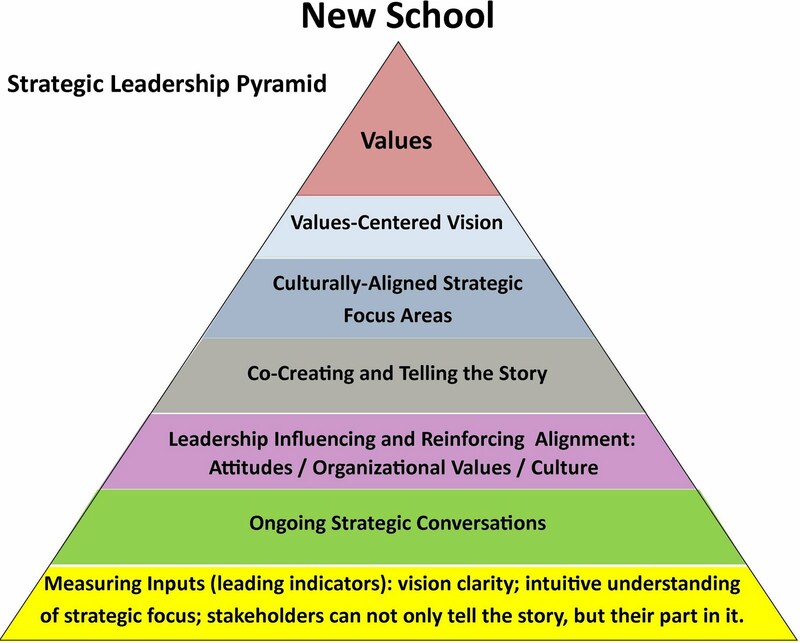 Vision and values are among the few items from the Strategic Planning Pyramid that remain on the Strategic Leadership Pyramid. They belong there because they are aspirational and inspirational, not operational or tactical. Strategic focus areas are another area of crossover. Obviously, strategies are strategic. Enough said. But, for further thoughts on strategy, see "Strategy, Plain and Simple" and "Haiku Strategy." Co-creating and telling the story means, let's describe vision and strategic focus in a compelling story format that is memorable and actionable. And the story needs to have specific relevance. That means, it's not just leadership's story. As the office receptionist, I know my part of the story, and it's personal, not general. And I can articulate it and play the role, too. I'll get into further detail on how to do this in future posts, but I touch on the concept in "Developing Intuitive Alignment." Last -- and this is where strategy gets operationalized in case you're wondering how strategic focus becomes manageable and measurable without the goals, objectives, action plans and the like -- is Ongoing Strategic Conversations. Instead of going back into an operational, project management-type approach, this approach requires ongoing strategic conversations with the operationalizers. The conversations focus on inputs, not outputs. They involve asking questions that surface incorporation of the vision and strategies into the various roles in the organization. I'll go into detail on this in future posts, as well. In short, this approach provides a blueprint for keeping leadership focused in the right place -- on leadership (people), not management (process). Changing the names doesn't change the intention. Strategic planning is essential. How you define it can be debated. I think that a one size fits all is not the solution to the struggle organizations have with strategic planning. After you develop your strategic plan (versatile and living) you develop your tactical plan. That plan requires a leadership strategy to translate the strategic plan or vision into an operational product. That is where you engage people. Because after all it is the corporate plan. I've written several previous posts that address your contention and I couldn't disagree more. First, a plan is NOT essential. Two things are essential: 1) having a vision/strategic focus (which is not the same as a "plan") and 2) taking actions aligned with the vision/strategies, which can be done with or without a plan. The name DOES change the focus. Strategy becomes associated and viewed in terms of a "plan," which not strategic, but tactical. The word "plan" and nearly all aspects associated with the methodolgy around "planning" need to be abolished from strategy making. In leadership, the focus needs to stay on people, not process. Influencing culture, visioning, strategic thinking and strategy making are leadership tools, and they are all people-focused. Planning is an operations and management methodology, not a leadership methodology. And it can be essential for success in certain operational applications, but not all. Good article. And, one I agree with. Senior managers tend to confuse strategic activity with tactical because the scope of their efforts seem bigger. For instance, it’s strategy because their focus is at a divisional level rather than more mundane daily tasks. This is synonymous with the confusion between managers and leaders. One manages tasks, resources, and time. One leads when they’re setting direction…and that direction-setting is a journey not a time-bound event. As a leader, I find my teams always have plenty of specific, time-bound activities to keep them busy :). We don’t always have time to sit down and ‘plan.’ If I have set a general direction (who we are, what we are about, where we want to go…) with the team, then everyone can make individual—yet aligned—decisions on their own. Thanks for taking the time to discuss this, I feel strongly about it and love learning more on this topic. private schools in delhi If possible, as you gain expertise, would you mind updating your blog with extra information? It is extremely helpful for me.